After my recent post about why simplicity in prayer is not only a good thing but the only real thing there is in praying, one of my oldest friends commented on my Facebook page about how it inspired her that she can pray in her own way and still be heard in her prayers. She was worried that if she didn’t use anything obviously deep or meaningful or profound that was written centuries or millennia ago that she wasn’t doing it right, but the words of Hermes Trismegistus helped calm her worries and reminded her of the right path of prayer. That’s an important realization that I know I’ve had to have multiple times, and I know many others are being reminded of it, some for the first time, some for the eleventy-first. Prayer is, according to the Oxford Dictionary, “a solemn request for help or expression of thanks addressed to God or another deity”, and ultimately comes from the Proto-Indo-European root *prek meaning “to ask, request, or entreat”. Throughout countless millennia, ever since humanity has been aware of the presence of divinity in our world or in any other, prayer has been the central vehicle for communion with the divine, with or without sacrifice. It is this unique act that we, as humans, are capable of in a way unlike any other living entity on Earth that allows us to seek communication and communion with higher entities than us through the use of our own higher faculties. Heck, even the Catechism of the Catholic Church (part IV, section 1) defines prayer as “the vital and personal relationship with the living and true God”, and that it is “the raising of one’s mind and heart to God or the requesting of good things from God”. When all other things are taken out of the equation, all religious action we undertake all boils down to a single essence: prayer. Due to its importance in all religious work we undertake, humanity has been compiling and transmitting their knowledge of prayers to any number of divinities and entities from one generation to the next, whether by word of mouth or by the written word. In my own work, I use prayers that have been in use for literal centuries or millennia, either in its original language or in a faithful translation into my own, from such varied sources as the PGM, exoteric and esoteric early Judaism, Catholic and Orthodox Christian traditions, Hermetic wisdom texts, Hellenic religious cults, and even some of my own original writings; you can see a small selection of what I have written down in my personal prayerbook over in the Prayers section of pages. I sing songs passed down to me through multiple generations of slaves and migrants in languages I can scarce understand, and I recite scriptures from lineages and faiths that are literally in my ancestral and living blood. All these prayers serve to open doors both in my mind and in the world around me, and I would be much poorer off if I had no knowledge of them. It goes without saying that there is power in all these ancient prayers that come from before my time. After being recited time and again by thousands or millions of people across countless cultures, lands, and eras, the combined faith and spiritual force that has been put into many of these prayers is overwhelming. Even those that I’ve written have been used regularly, sometimes even daily, for years, and hold great importance and power even for myself and others. Of course, the ones I’ve written barely hold a candle to those that have been passed down from one generation to the next of priests, magicians, and other religious people, especially those prayers that have been composed by sages and mystics far wiser and holier than I am, and those who actually knew what they were doing. Using these prayers that both look and feel Powerfully Old has value for its own sake. In many cases, such prayers were devised for a purpose, the wording exactly and precisely chosen to cause certain effects in ourselves and the world around us because of what they seek, express, and ask for. In such cases, these “purposeful” prayers are indistinguishable from spells or conjurations; indeed, many spells and conjurations I use are identical in form, structure, and diction to what you might find used in the Roman Ritual or in a modern church service. Simply by reciting these prayers with a true need and a sincere heart, even just once and that quietly, can produce powerful and wondrous effects in your life, and it helps to have an index of them handy just in case for a variety of services or needs; this is one of the reason why I maintain and carry with me everywhere my own enchiridion, my own handbook of prayers and rituals, just in case I need something specific for a particular purpose. Even still, all that being said, reciting prayers that have been recorded and presented to you isn’t all there is to prayer. After a certain point, the same prayers recited over and over, even if it starts out meaningful, can sometimes become meaningless, soulless, and empty; some people, after settling into a routine for the sake of routine, end up praying the same empty words as a routine. This drains the efficacy and power of prayer, because all you’re doing is saying the words for the sake of saying the words because you’re used to saying them. Other people like to keep “enhancing” their prayers by introducing longer and more elaborate phrases, in an attempt to keep the air flowing and trying to reclaim some of that initial wonder through more of the same, but this often misses the entire point of prayer. This is pointless; as Jesus said in Matthew 6 (despite the context-appropriate disdain for “pagans”), “when you pray, do not keep on babbling like pagans, for they think they will be heard because of their many words; do not be like them, for your Father knows what you need before you ask him”. You don’t need to keep saying the same things over and over louder and louder to be heard. Words alone are not the only part of the vehicle of prayer, no matter how old those words are, who said them first, or how many you use. If your heart isn’t in the prayer, you’re just giving a soliloquy to be heard by yourself and nobody and nothing else; if you pray without heart, you’re not praying. In the end, all true prayer comes from the heart. It’s that personal divine spark that sets off the holy fire that enflames us in prayer, within which we can become consumed and by which we can become refined into a holier state of being. All these recorded prayers that we have at our disposal are meant to gather up the flames of the heart into a holy bonfire that reaches to Heaven and illumines our entire world; that’s why we have them, and why we use them. We recite these old prayers with the intent that our hearts become a spiritual muscle, becoming stronger with each use, and which we use to elevate ourselves and our minds to the Divine; to recite them by rote without actually using the spiritual muscle of our heart is nothing more than going through the motions, which at best does nothing to make us stronger than we already are, and at worst leads us into the atrophy of despair, depression, and faithlessness. So what are we to do, if the practice of reciting prayers eventually breaks down? Simple: we don’t let it break down in the first place, because the intent of prayer should be fresh, pure, and strong each and every time you even reach for your cheatsheet or enchiridion of prayers. Each word you say should be as if you’re saying it for the first time, each divine thought should be like fresh, clean, unused water splashed across your face and body. Prayer is a vehicle, but our hearts and souls provide the fuel that keeps it going to our ultimate destination. However, after a time, you’ll find that the vehicles you’re used to aren’t critical to the process; the fuel you provide through your heart and soul in prayer is the real power in the whole process that will eventually get you to where you need to be by virtue of themselves. This fuel will self-ignite, and not only propel you further in your Work, but ends up consuming your entire self as fuel for the flames. This is what I mean by “enflaming yourself in prayer”, and this is the true means of prayer, whether or not you recite something written down thousands of years ago or said anew for the very first time. In the end, the two are indistinguishable. The door to true communion with the Divine can only be opened by true, personal, intimate, private prayer, and the key to that door never looks the same twice. The notion of spontaneous prayer here is key: it’s what simply comes out through the mouth from the heart, and is in many cases the seed from which all recorded prayers are grown. It is a genuine, in-the-moment expression of prayer that is not dictated by any rule or rhyme, but which simply happens. It may be guided by frameworks of prayer instilled in the head through routine and habit, but it is intimately, completely personal how it comes out and becomes expressed. If the old prayers handed down from time immemorial are elaborate carvings and breathtaking works of art made by the great masters of wordsmithing of ages past, this spontaneous prayer said in the moment is like a cluster of wildflowers bursting through the earth on the first morning of spring to bask in the Sun: it might look small and delicate, but it is a raw, unstoppable force of nature in its own right, and beautiful in its own pristine, unrestrained way. Heck, at a certain point, even spoken or thought words stop being useful, and the real prayer starts becoming the rarefied, ideal thoughts behind any possible words of prayer that only the heart can wordlessly utter. This is the idea behind the Hymns of Silence, which I describe as the highest kind of prayer humans can make. These are the hymns and songs of prayer that even the angels sing unto God in praise, admiration, and gratitude, and which lie behind any and all prayer we can earnestly make. Strip down true prayer to its core, and what you have are the Hymns of Silence: wordless, unspeakable, ineffable Love and Thanks for the Creator. Of course, getting to the stage where knowing what the Hymns of Silence are, what they “sound” like, and how to “sing” them takes effort, just as any muscle requires training and time to develop. I got a kickstart on that process through my planetary conjurations that culminated in the conjuration of the angel of the fixed stars, where even the usual physical tools and implements of magic stop being of use to us in a true astral realm. However, whether you ascend through conjuration of the spheres or by climbing the ladder of prayer from Down Here to Up There, the result is the same: an outpouring from the heart of true communion with the Divine. This is the real goal of true prayer, through which any desire can be effected, any hope expressed, any wish granted, any request made to the Divine. Wake up in the morning, and wash my face and hands in cold water (if I don’t take a full shower at this point). Basically, a simplified form of ablution with khernips or other lustral water, and reminiscent of the process of wuḍū` for Muslims. Light a simple candle and recite a blessing over it. I typically use the Trithemian Rite consecration of fire from this, but you can say whatever you like to consecrate the fire for the sake of holiness and divine presence and protection. Meditate for at least 10 minutes, if only to quiet the mind. Recite the Prayer of Hermes Trismegistus. Recite the Prayer of the Itinerant. Recite the Our Father, Hail Mary, and Glory Be. Recite a personal Prayer of the Geomancer. At this point, my heart and mind are focused and empowered enough to say a spontaneous prayer, which can take any form: gratitude for the days I’ve been given, hope for the day I’m about to face, seeking help to power me through my fears, or whatever else rises from the flame of my heart in prayer. Eventually, the flame of my heart takes over, and begins burning of its own accord without being ignited by spoken prayers; this flame rises to my mind and sets off a conflagration of looking upwards to Heaven and simply Being in Prayer; this is the beginning to the Hymns of Silence, which (if I have enough time to spend) can go on indefinitely until the flame weakens and I begin to look back down to Earth and myself. I know it sounds corny or mysterious, but I don’t have a much better way of describing how it feels. It’s almost a trance state, uplifting in the same automatic way that the heat from a fire sends purified white ash upwards through convection. Over time, these muscles of the heart become stronger, and it becomes easier to start the fire of prayer, going from a rousing, raging, holy blaze into a still, silent, sacred Light. I’m working on that process day by day, and I hope to keep working on it to get even farther than I ever was, even when I was in a regular dedicated routine. Like in anything else, dedication and resilience make for the best guides in the Work, and it helps make prayer truly effective like it does anything and everything else. Also, dear reader, you may have noticed that there’ve been more changes to this website recently. Thanks to all your generous support through donations, purchasing my ebooks and materia magica, and obtaining my divination and consultation services, I was finally able to secure the funds for a professional WordPress account! Not only does this mean I finally got a proper domain name for the blog (https://digitalambler.com/, but you don’t need to update your bookmarks to use it! ), but I got an even nicer site layout, all those invasive ads are gone, and a few other cosmetic tweaks have been made throughout the site to make it easier to read and navigate. One of the really nice things is that it’s allowed me to revamp my Services page to actually look and feel useful, too, so if you’re interested in commissioning me for divination, consultation, ritual work, or other needs, go on over and take a look! Plus, with the recent blog redesign, I consolidated and changed some of the Occult and Prayer resources through the top menu. In addition, I also added a whole new page on the Headless Rite, which is more fully fleshed out and offers a full Greek original text, as well as a whole section of prayers from the Corpus Hermeticum, condensed from other posts around this blog for ease of reference. Putting these out is a pleasure of mine, since I hope to make these resources more easily accessible for all who visit my blog. Of course, keeping this website as functional and clean as it is (to say nothing of keeping my projects active to continue providing new and awesome content for my readers) will continue to take money, so please help continue supporting the Digital Ambler! You can do this through any number of ways: checking out my Etsy store for my ebooks and materia magica, checking out my Services page for my divination and ritual comissions, or just buying me a coffee through Ko-fi! Also, don’t forget my 20% off sale on all my divination services through Etsy through the end of January 2018! All your support will help me keep my website beautiful, awesome, and helpful to myself, you, and the occult community as a whole! Do you have any suggestions for improving or augmenting my services, supply of goods, crafts, or ideas for posts? Is there anything glaringly awful about this website you’d love for me to fix, or anything you’d wish me to include for reference and ease of access? Do you just want to send me a note of encouragement to keep up the Work, or want to say how my own Work has helped you in yours? Feel free to send me an email through the Contact page and let me know! The Seals of the Zodiac in the Ars Paulina are the same seals that Paracelsus prescribes in his Archidoexes, On Occult Philosophy. The recipes use to make these seals are of Paracelsian origin, but all the mistakes are also in the Turner translation. Joseph Peterson made up a comprehensive table, and we can see that all translation mistakes made by Turner turn up in the Ars Paulina. From there, every manuscript of Ars Paulina perpetuates Turner’s mistakes. The year 1641 is mentioned in the text, also gunpowder. ‘Two triangular figures, cutting one another thorow with a cross, are so painted or engraven, that they do include and divide themselves into seven spaces within, and do make six corners outwardly, wherein are written six wonderful Letters of the great Name of God; to wit, Adonay, according to their true order. This is one of the Characters we have spoken. We might be tempted to say that this is a quite simple pentacle, met all over. But I was not able to find one such seal, either in print or in manuscript, that dated before the publication of the Archidoxes. The author of the Pauline art was so much of a Paracelsian, that he even denied the spirits evoked the right to have a seal, making their lamens exclusively astrological. It is my guess that the table of practice had much to thank Paracelsus; its central figure is exactly what he describes. 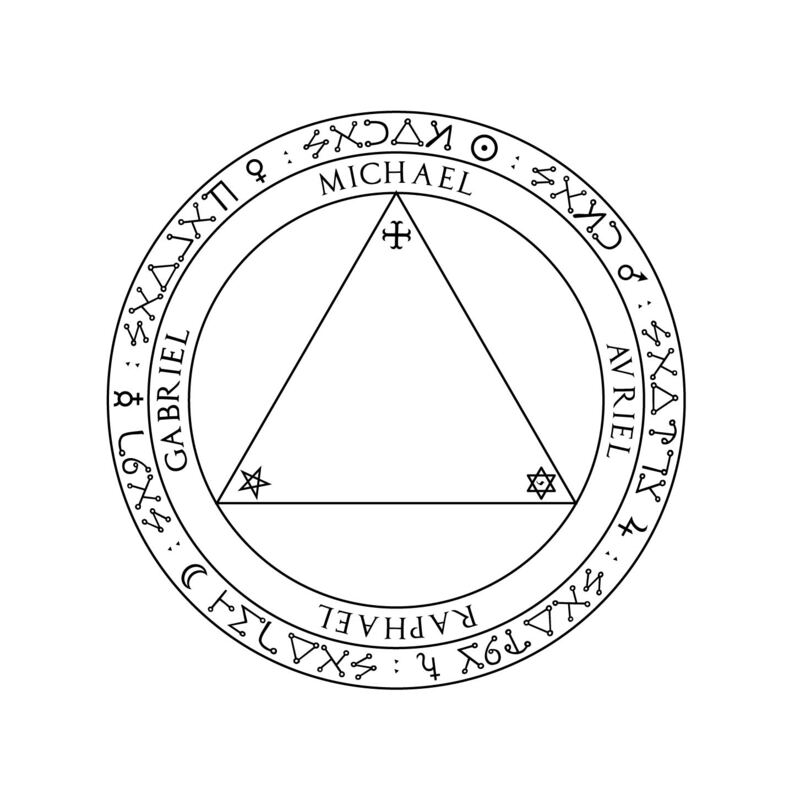 Given the Paracelsan connections between the Arbatel and the Ars Paulina, and the fact that they’re not too far distanced in time and space, I found it okay enough to incorporate a prayer from the latter into a ritual of the former. As you can see, the first image is designed as close as possible to the original text itself. The second image, however, is a variant I designed where I first swapped out the placements of the planetary circles to better match a more heliocentric sphere-based (or, as some might say, qabbalah-based) arrangement, rotated the planetary circles so that they “point” outwards away from the center of the Table, and use the divine name Elohim instead of IHVH, with one letter put between each pair of outer planetary circles for a more balanced arrangement. Of course, were I to use these, I’d first use the by-the-book design and only later, if I felt comfortable enough doing so, would try variants. Still, it was a fun little project. It also lists numbers of servants, either under the angel or for each duke, and how many dukes there are both of the lesser or greater ranks, and also a name for the hour itself (except for the first hour), but these don’t appear to be used in the grimoire at all. Now we can see what Asterion meant when the author of the Ars Paulina “denied the spirits evoked the right to have a seal, making their lamens exclusively astrological”. There’s a possibility of going with Arbatel aphorism III.17 where one can get a specific seal or character from the spirit to use in that specific hour, which would be good only for that particular magician for a given timeframe like 140 years according to the Arbatel’s reckoning, but I think you’ll see why I wouldn’t bother later on. O you mighty, great, and potent angel Samael who rules in the first hour of the day, I, the servant of the Most High God, do conjure and entreat you in the name of the most omnipotent and immortal Lord God of Hosts, IHVH Tetragrammaton, and by the name of that God that you are obedient to, by the head of the Hierarchy, by the seal that you are known in power by, by the seven Angels that stand before the Throne of God, and by the seven planets and their seals and characters, by the angel that rules the sign of the twelfth house which now ascends in this first hour, that you would be graciously pleased to gird up and gather yourself together, and by divine permission to move and come from all parts of the world, wheresoever you may be, and show yourself visibly and plainly in this crystal stone to the sight of my eyes, speaking with a voice intelligible and to my understanding, and that you would be favorably pleased that I may have familiar friendship and constant society both now and at all times when I shall call you forth to visible appearance to inform and direct me in all things that I shall seem good and lawful unto the Creator and you. O you great and powerful angel Samael, I invoke, adjure, command, and most powerfully call you forth from your orders and place of residence to visible apparition in and through these great, mighty, incomprehensible, extraordinary, and divine names of the great God who was and is and ever shall be: ADONAI, SABAOTH, ADONAI, AMIORAM, HAGIOS, AGLA, ON, TETRAGRAMMATON! By and in the name PRIMEUMATON, which commands the whole host of heaven whose power and virtue is most effectual for calling you forth and ordering creation, and which commands you to transmit your visible rays perfectly into my sight, and your voice to my ears, in and through this crystal stone, that I may plainly see you and perfectly hear you; speak unto me! Therefore, move, o mighty and blessed angel Samael, and in this potent name of the great God IHVH, and by the imperial dignity thereof, descend and show yourself visibly and perfectly in a pleasant and comely form before me in this crystal stone, to the sight of my eyes, speaking with a voice intelligible and to my apprehension, showing, declaring, and accomplishing all my desires that I shall ask or request of you both herein and in whatsoever truths or other things that are just and lawful before the presence of Almighty God, the giver of all good gifts, unto whom I beg that He would be graciously pleased to bestow upon me. O servant of mercy Samael, for all these, be friendly unto me, and act for me as for the servant of the Most High God, so far as God shall give you power in your office to perform, whereunto I move you in power and presence to appear that I may sing with his holy angels: O mappa la man, hallelujah! O you mighty and potent angel Samael, who is by the decree of the most high King of Glory, ruler and governor of the first hour of the day, I, the servant of the Most High, do desire and entreat you by these three great and mighty names of God AGLA, ON, TETRAGRAMMATON, and by the power and virtue thereof to assist and help me in my affairs, and by your power and authority, to send and cause to come and appear to me all or any of these angels that I shall call by name that reside under your government, to instruct, help, aid, and assist me, in all such matters and things according to their office, as I shall desire and request of them that they may act for me as for the servant of the Most High Creator. Beyond that, not much is specified in the way of ritual, though as can be seen, a crystal shewstone is mentioned in the invocation. The text does say that, when the spirit comes, they should be welcomed, you should ask your desire of them, and when you’re finished, “dismiss him according to your orders of dismission” (i.e. whatever usual prayers or words you give to dismiss a spirit). For the life of me, I couldn’t figure out why I would bother with the method given in the Ars Paulina. Like, it’s interesting, and it’s got my attention, but I honestly don’t know why I would go through the trouble of this, even for the sake of occult exploration. It’s not a matter of “here’s a more efficient way of getting what you want”, but knowing that I already time my conjurations according to the planetary hours, why would I bother with remembering who’s who and when from a list of 24 angels, rather than working with one of the seven planetary angels, a much smaller list to memorize? Plus, it seems more, yanno, direct to just work with the angels of the planets rather than the angel of an hour which is ruled by a planet. 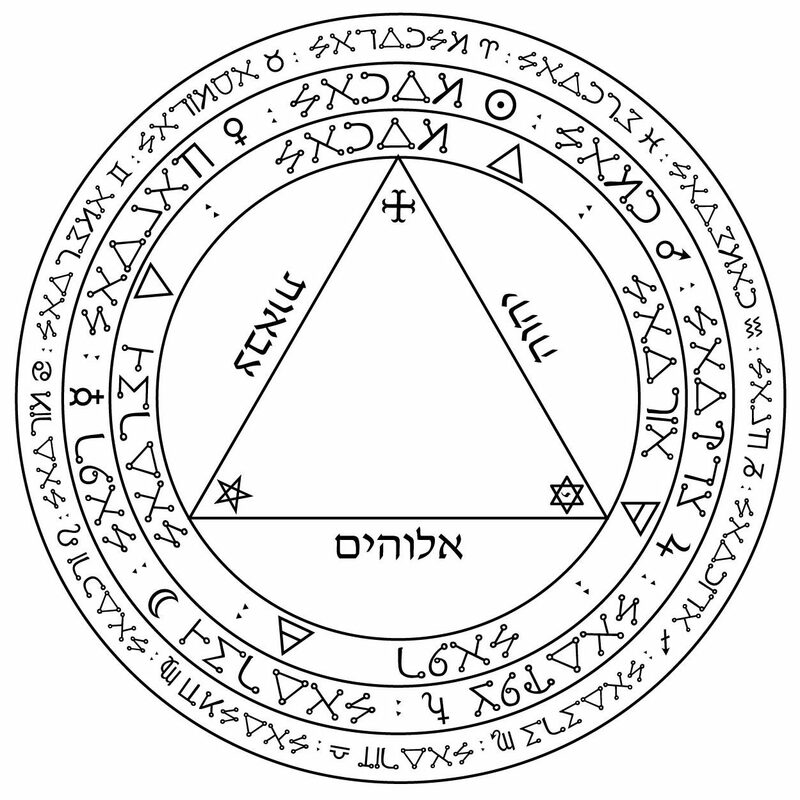 If the Trithemian rite of conjuration as given by Francis Barrett was indeed developed later than the Ars Paulina as I suspect, then it seems to be a simplification for the sake of efficiency (to which I can successfully attest). This is where I started asking questions and digging in deeper. One helpful description of the Pauline working comes from Imperial Arts on their LJ (where they give a description of how they work the Pauline Table), notes that the method of creating the seals for the angels of the hours doesn’t tie you to them, but rather to the time and space of the conjuration (especially considering the implied use of specific space-based house systems as given by the example seals in the Ars Paulina). This is unique, and such a simple observation surprises me. In pretty much every ritual I’ve done, there’s always been the unstated assumption that I need to make some sort of ritual space separated out from the rest of the world; through the use of wards, circles, and spiritual boundaries, I insulate myself and my space so that I can work as undisturbed as possible from external influences in the space around me or my temple. Separating myself from timing is impossible, and indeed the spiritual connections of the time of my rituals is something I incorporate fully, but the spiritual connections of the place (beyond genii loci or having to deal with physical disturbances) is something that never occurred to me to incorporate in a ritual framework. Plus, since the hours of the day (in the old reckoning) are inherently tied to the place, I’m kind of embarrassed I never put two and two together like this. It is also to be known, that the Angels do rule the hours in a successive order, according to the course of the heavens, and Planets unto which they are subject; so that that Spirit which governeth the day, ruleth also the first hour of the day; the second from this governeth the second hour; the third; the third hour, and so consequently: and when seven Planets and hours have made their revolution, it returneth again to the first which ruleth the day. So what gives? What’s with all the hour names and angels of the hours? Besides the fact that using these in ritual ties you temporally and spatially to the ritual, especially in the Ars Paulina way of creating seals based on the actual horoscope of the ritual, why would we bother with using these annoyingly large lists of names as opposed to a simpler, more efficient, and no less effective set of seven planetary angels? Turns out, that’s the wrong question to ask. Technically, yes, you can call upon the angels of the hours for pretty much anything that you can call upon the angels of the planets for, at least in terms of getting stuff done down here. In fact, according to the opinions and experiences of my friends and the reasons why these angels of the hours were developed in the first place, it actually might be more effective to call upon them instead of the planetary angels alone, specifically because of their limited scope and being tied temporally and spatially to a given context. In some ways, they can be considered one of the most powerful set of spirits because they’re so immediately present in a spatial and temporal (or at least temporal) sense. Just as you could work with some generic deity of the Earth, you could also work with the specific genius loci of your land, which is generally a more recommended practice because they’re so much more powerful within the limits of their own domain (for more info on this, check out Kalagni’s posts about genii loci on eir’s blog Blue Flame Magick). I conjure you, angel NN who rules this hour and who is appointed for the provision and service of mankind; angel NN, eager at all times, strong, brave, and sharp! I conjure you by God who ordered you to guard this hour to be my collaborator, together with your submissive demon NN, who is appointed to be servant at this hour. Cooperate with me, and make my work effective, good, and true. If the angels (and demons) of the hours are more forceful in their works because of their spatial-temporal presence, then note one of the ramifications of this: any of their antics can cause problems for you both spatially and temporally in a way that planetary spirits wouldn’t be able to cause so quick or so hard because of their spatial-temporal distance. Just as how any event where the genius loci is troubled can go awry because the spirits of that land are unsettled, how much more so would it be if the angels or demons presiding over the immediate time and space of your ritual were acting up? Many magicians nowadays take pains to guard their temples and sacred spaces and ritual areas from physical, acoustic, and spiritual invaders, but I haven’t heard of anyone warding the time or the overall spatial-temporal context of the ritual. In this sense, we have an exceedingly good case to make to bring back the angels of the hours, or at least reincorporate them into our work: to give us further protection in our rituals by warding not only the space of the ritual but also the time of the ritual, by focusing on the most immediately felt and known temporal effect, that of the hour itself, apart and before any planetary rulership even begins to come into play. You can see this in how far the Heptameron goes to build its Circle of Art, by incorporating the names of the hour, the season, the spirits of the winds, the minor angels of the heavens, and the planetary angel(s) of the day itself. While we don’t need to go so far to clear the airs, so to speak, I claim that by simply giving a token nod to the angel ruling the hour of the ritual, we can make our results much stronger and more direct. We probably needn’t do much more than offer a sincere invocation to the angel of the hour with its dukes in the Pauline fashion, or to the angel with its demon of the hour and day in the Hygromantic way, simply to open the ways for our ritual to proceed as we desire and that all baneful, harmful influences be kept at bay by the strength and virtues bestowed upon the angel and its ministering spirits/serving demons. This is definitely something I want to explore more, in addition to the Arbatel works, and see if I can’t augment my already-existing Trithemian rite with an invocation to the angel of the hours. I’d need to get more supplies and tools for it, but I think a proper Pauline Table of Practice to experiment with wouldn’t hurt, either.